To Sum It Up: In a single night, Helen Cartwright loses her family and her home and is thrown into a world that she has unknowingly been preparing all her life to enter. Helen discovers that she is a Keeper, a descendant of angels who watches over Earth. With the assistance of fellow Keepers Darius and Griffin Channing, Helen must begin fulfilling her new obligations and find whoever is hunting down the Keepers. Review: I don’t seem to be having much luck with angel novels lately. The plot synopses sound really interesting, but in the end, the books fall short of expectations. 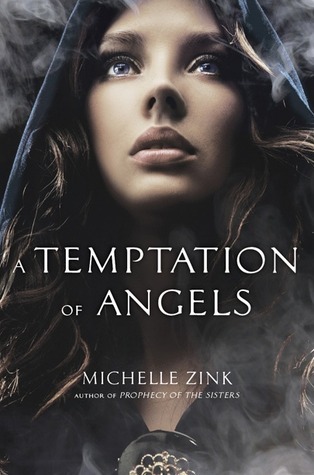 A Temptation of Angels gets off to an exciting start, with our protagonist, Helen, being ushered by her mother to a secret passageway in the middle of the night with instructions to flee their home and go to the address that her mother has given her. With such a promising opening, it was disappointing when the plot and characters turned out to be rather run-of-the-mill. I think that Helen had the potential to be a dynamic heroine. She’s pretty accepting of the news that she’s a Keeper, applies herself to training as one of them, and, realizing the kind of situations that she’ll be dealing with now, has clothes more befitting her new responsibilities tailored for her (this story takes place in Victorian London). My problem was that Helen never seemed to display all of the depth that there actually was to her character. I felt as though the book skimmed the surface of her personality, thus leaving the character kind of flat. The same goes for the other characters; I didn’t find any of them especially memorable. Normally I love novels which take place in Victorian England, but this one seemed detached from its setting. If London hadn’t been mentioned explicitly as the location, I wouldn’t have guessed what it was. If it hadn’t been for the descriptions of people’s clothing and the references to streetlamps and horse-drawn carriages, I wouldn’t have guessed the book’s time period easily, either. Although the pacing is solid, the plot doesn’t stray far from your typical good vs. evil face-off. In general, this book had some great ideas, but they weren’t explored in enough depth to pull me into its world. All in All: If you like books about angels, you might want to give this one a try. Personally, I needed more details about the world and more dimension to the characters. If these things had been better fleshed out, they would have greatly enhanced my reading experience.